These brown fur antlers are perfect for creating a deer or reindeer costume by paring up with a brown unitard. They also work for creating a Rudolph the Red Nose Reindeer costume for Christmas by adding one of our red noses! Antlers measure 6 1/2" tall. 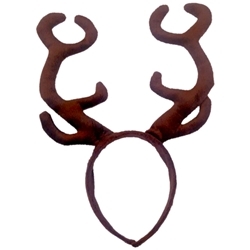 These antlers are on a headband for easy and comfortable wear and features bendable wires in the antlers so that you can shape them into any position that you wish.